The views and/or opinions expressed herein are solely those of the author, is the author's original work, and do not necessarily represent those of the Montessori Co-op School, its administrators, board or the parent body. The Montessori Co-op School parents’ blog is a forum for our school parents, faculty and staff to share parenting ideas and related issues. 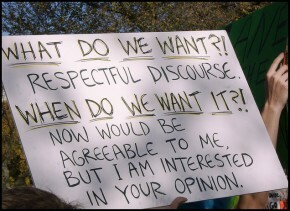 Civility in blog posts and comments is required. If you have any questions or concerns, or would like to submit an original contribution for publication, please contact us. I know that my 9 year old has some knowledge of and concern about his ideas, but, let’s be honest, my 4 year old does not. Where is she picking up this hatred of Donald Trump? I am pretty sure I can’t blame the media on this one, at least not directly. The Wild Kratts or My Little Pony don’t spend much time talking politics. And since they view their shows via streaming services, my kids aren’t seeing political commercials. The only thing I can conclude is that she’s picking this up from the opinions she hears expressed around her. Possibly at school from other kids. Certainly from her sister, this much I know. But I’m embarrassed to admit it’s probably also coming from overhearing her parents talk. And that’s not an implication I like to ponder. How can we model kindness and civility and treating people with respect (even when we disagree with them) when our children are going around calling people idiots? I know this problem goes beyond my backseat–I saw a story on NPR this morning that pointed to this very issue as rampant right now. Kids are taking what they are hearing into their own social contexts, and the result is not pretty. And it bears mentioning that it’s not all Donald Trump–there’s plenty of incivility between candidates and their supporters in both parties right now. It’s only April…and November seems very far away. As we participate in this political season, and as we try to involve our kids in current events and share our political values, how can we parents be more Montessori about that? How can we model independence, self discovery, kindness, and peacemaking instead of namecalling and indoctrination? Sheri is the mom of Clara (age 4) in Miss Nicole’s room at the Co-op and also 9 year old Lucy, who attends public school. Intolerance of the intolerant is still intolerance. Thanks for this timely message, Sheri. I really do not like seeing any politics raised in this blog. The blogging should be done by the kids. I wouldn’t touch this topic with a 10 foot pole. The parent blog was created to discuss parenting issues in light of the Montessori principles we all hold dear. I’m confused about what seems controversial here–this blog is not really about politics, except as context. There is an election going on that is particularly uncivil, and some of our kids are picking up on that. What are some ways we Montessori parents deal with that if we want to raise children who are kind and respectful? I shared my own self deprecating story, and admitted maybe we’ve not done things right in discussing politics around our children and how I’m trying to turn that around in my family. I’m interested in hearing the ways others do things. So what would you say to your own children in this situation, Julia? Sorry but this a parent blog and I am grateful we have a forum to be thoughtful and deliberate about our choices as people and parents. Thank you Sheri! Julia, I don’t see this about politics per se as much as parenting. Can we model and engender a sense of generosity and humility in our children that allows for kindness towards even those we see as fundamentally misguided or even morally corrupt? Can we offer critique and correction in equal measure with love? Sheri I really appreciate this topic, especially in our current political climate. I come to this parent blog for guidance and thoughts on how others approach topics such as this. Like it or not, these are things that our kids may hear about or see and it’s important to teach them tolerance and understanding of other’s viewpoints, even when we may not agree with them. Respectful dialogue regardless of topic. Ellie really hasn’t been that interested in the election despite constantly hearing about it in our house. However, I am glad you wrote this because it helps me prepare for what she could possible say or ask. Thanks for the reminder to keep our own comments above the fray and to model kindness towards people we don’t agree with.